Vatican City, Aug 5, 2017 / 04:24 am (CNA/EWTN News).- Pope Francis has dedicated the month of August to praying for artists, praising them in his latest prayer video as heralds of God’s beauty, and asking that through their work, they would help humanity discover the wonder of creation. The video opens with the Pope telling viewers in his native Spanish that “the arts give expression to the beauty of the faith and proclaim the Gospel message of the grandeur of God’s creation,” as musicians sit outside holding their instruments with nothing but the sound of nature in the background. First launched during the Jubilee of Mercy, the videos are part of an initiative of the Jesuit-run global prayer network Apostleship of Prayer and are filmed in collaboration with the Vatican Television Center and the Argentinian marketing association La Machi. The prayer intentions typically highlight issues of importance not only for Pope Francis, but for the world, such as families, the environment, the poor and homeless, Christians who are persecuted and youth. Pope Francis has often praised artists – usually circus performers who put on a show during a general audience – for their contribution to beauty, and has made special efforts to make the Vatican’s treasures available to those who otherwise wouldn’t have the opportunity to see them. In October 2013, just a few months after his election, the Pope held an audience with the Patrons of the Arts, established some 30 years ago to fund restoration projects in the Vatican museums. “In every age the Church has called upon the arts to give expression to the beauty of her faith and to proclaim the Gospel message of the grandeur of God’s creation, the dignity of human beings made in his image and likeness, and the power of Christ’s death and resurrection to bring redemption and rebirth to a world touched by the tragedy of sin and death,” he told the patrons. In March 2015, the Pope invited a group of 150 homeless for dinner and a private tour of the Vatican museums and the Vatican City State on the premise that beauty is for everyone. 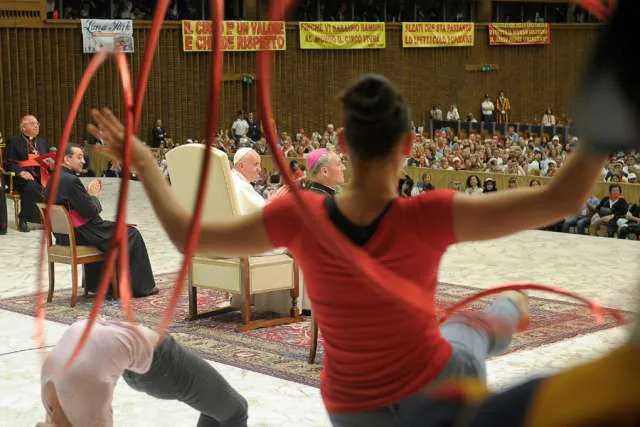 A year later, in June 2016, the Pope received some 6,000 traveling performers in the Vatican for the Jubilee of Circus Performers, telling them that while their work is demanding and at times unstable, it enables them to bring light to an often dark world. “You are artisans of celebration, of wonder, of the beautiful: with these qualities you enrich the society of the entire world,” he told the group, which performed various acts for the pontiff. Similarly, in December of the same year, Pope Francis sent a message to the annual meeting of the Pontifical Academies naming the winners of that year’s Pontifical Academies Award, whom he had chosen. 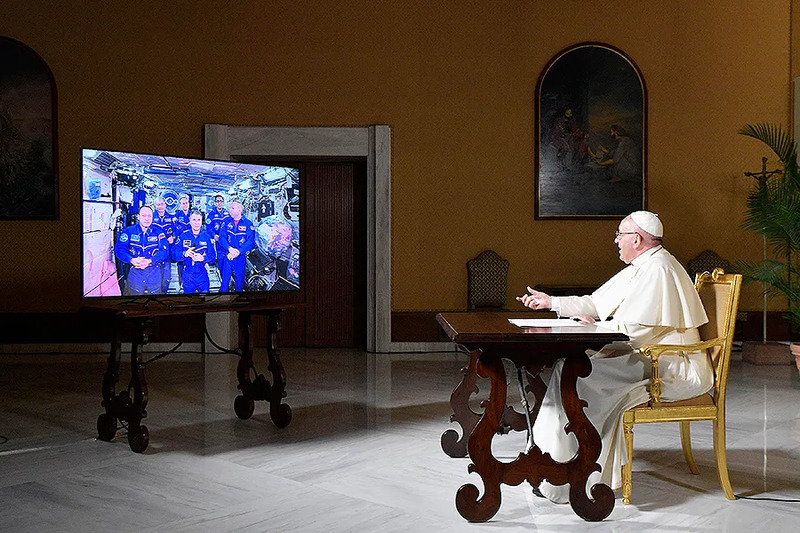 Vatican City, Oct 26, 2017 / 12:53 pm (CNA/EWTN News).- Pope Francis conversed with astronauts orbiting earth on the International Space Station on Thursday, discussing questions as diverse as man’s place in the universe, the fragility of life and the planet, and international cooperation. “Astronomy makes us contemplate the horizons of the universe and raises questions in us: Where did we come from? Where are we going?” the Pope said. Italian astronaut Paolo Nespoli responded, saying that man’s place in the universe is a “complex question,” especially for him since his specialties are in the technical realm. However, he noted that being in space has helped him to realize that the more humanity learns, the more clearly we can see how much we still do not know. “I would love for people like you, not just engineers, not just physicists, but people like you (Holy Father) – theologians, philosophers, poets, writers… – to come here in space, and this will surely happen in the future, I would love (for them) to come here to explore what it means to have a human being in space,” he said. Pope Francis contacted NASA’s International Space Station via a satellite call from the Vatican on Oct. 26. Aboard the space station are a total of six astronauts, including three Americans, two Russians and one Italian, who have been orbiting the earth, about 220 miles away. Three will return to earth in December of this year, and the other three in February 2018. For example, Francis asked the team what motivated them to become astronauts, and what they enjoy about being in space. “Traveling in space modifies so many things that are taken for granted in everyday life, for example the idea of ? ?up and down,” he said, also asking if there is anything about living in the space station that has surprised them. Pope Francis responded by saying that he loved that answer, how Bresnik had pointed out the earth’s fragility, how it’s a “passing moment,” the earth turning at a rate of 10 km per second. The astronauts also spoke with Francis about their own diversity and how it is an asset in their work on the International Space Station. “As we work here on the space station and in our international partnership, we hope that the example of what we can achieve together is an example for all the world and humanity,” Bresnik said. Francis said that although our society is very individualistic, cooperation is essential in life, asking about examples of collaboration in their work. The International Space Station is a great example of international collaboration, American Joseph Acaba replied, because the crew members are from different countries and cultures, and they work together, also communicating on a daily basis with control centers in the U.S., Russia, Japan, Canada, and nine different countries in Europe. The other astronauts on the call were American Mark T. Vande Hei, and Russians Aleksandr Misurkin and Sergey Ryazanskiy. The encounter between the astronauts on the space station and the Pope was a fascinating intersection between religion and science, said Aschbacher, noting that science can assist in the search for God through its curiosity to better understand our world. Science asks some of the same questions as religion, such as, “where we are from and where we are going and where do we live,” he said. Roberto Battiston, president of the Italian Space Agency (ASI), added that “there is no doubt that science is a way of searching for the truth” and though religion and science may have different ways of searching, they still have the same goal. Pope Francis’ call marks the second time a pope has contacted astronauts in space. In 2011, Pope Benedict XVI became the first when he called the International Space Station via satellite link, speaking with 12 astronauts for about 20 minutes. In the call, Benedict asked the astronauts questions about what it is like to view the earth from outer space and if it gave them a new perspective on the importance of promoting peace and caring for our planet’s resources. 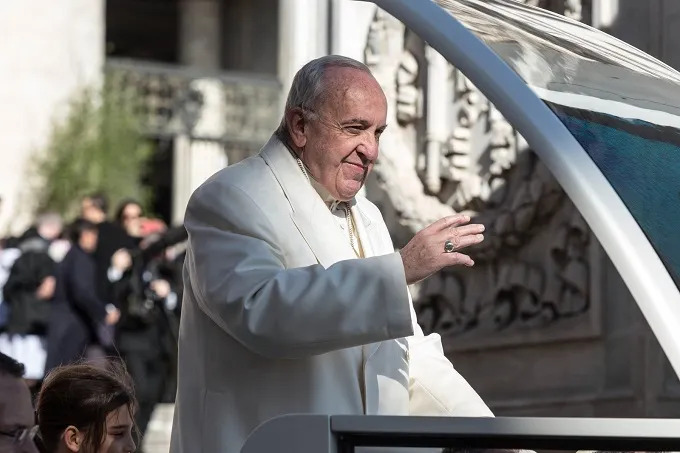 Vatican City, Apr 19, 2017 / 06:05 am (CNA/EWTN News).- As the Church jumps into the Easter season, Pope Francis Wednesday offered a reflection on Christ’s Resurrection and the start of Christianity, saying it’s not about us and what we do, but what the Lord has done for us.